President prepares for Passover with 'bedikat hametz' with the help of his grandson Shai. First Family to host lone soldiers for holiday. Jews around the world are completing the final preparations ahead of the Passover festival, which begins Monday evening, and President Reuven Rivlin is no exception. The President and First Lady Nehama Rivlin will host both family members for the festival and lone soldiers serving in the IDF while their families remain abroad. 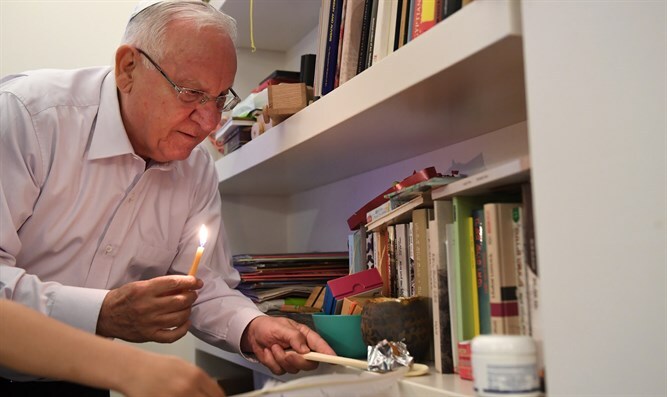 On Sunday evening, President Rivlin, aided by his grandson Shai, completed the traditional “bedikat hametz”, to search for any remaining leavened bread in the house. Last week all hametz in the president’s residence as sold (so as to not remain in his possession during the festival), and the usual kitchen dishes and utensils swapped with ones kept clean from hametz and used only during Passover. Since he became President of Israel in 2014, the President and the First Lady have kept a tradition of inviting lone soldiers to join their extended family for the Passover seder, a tradition they will continue this year, with two long soldiers joining the Rivlin family Monday night. The two lone soldiers invited to the Rivlin family seder are Valeria Kogan, a Border Police officer who immigrated by herself from Russia; and Omer Openheim, an American-born paratrooper now living in Rehovot.